All anyone can seem to talk about in regards to the Blue Jays is the attendance, or lack thereof. 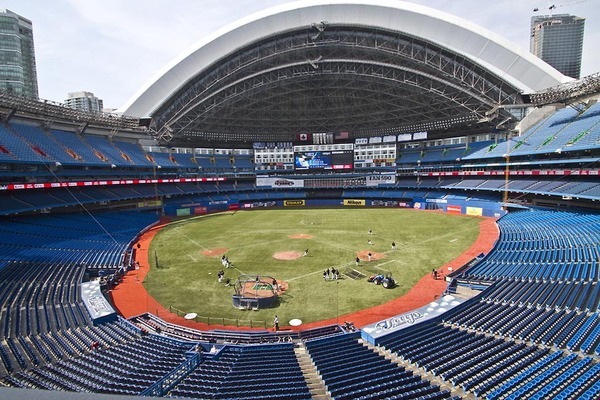 Yes, the Blue Jays have the lowest average attendance per game in the majors at just a shade above 15,000 and that is helped out due to a near sellout crowd on opening day. To be quite honest, I am growing weary of hearing about the topic every day and the focus being shifted away from how the players are playing on the field. So, I’ll solve the issue once and for all by addressing it here in a blog post. There is no greater feeling than spending an afternoon at the ballpark. Doubtless there are better places to spend summer days, summer nights than in ballparks. Countless. Nevertheless, decades after a person has stopped collecting bubblegum cards, s/he can still discover him/herself collecting ballpark memories. And not just the ballpark itself and surrounding neighbourhoods, their smells, their special seasons and moods. Quaint? Sure. Beautiful? Maybe. However, when the sun is bright and the air crisp and your seat seems close to the action than the on-deck hitter, every hardship in your real life is forgotten. Think back to when you were a child. The stands looked enormous, the outfielders cavorting in the outfield looked miles away from you. This cavernous cathedral that you went to that was vast. And as a child, everything looked so large and bigger than life in your mind’s eye. A great many of us think back to baseball in connection with our fathers. Maybe our grandfathers. Uncles. With people who played particular games at sometime, but also with whom we went to particular games with. Also people we played catch with. There is something historical about baseball. When you walk through the gate to see the field shining in front of you, you are not back in time; you are outside of time. For one moment we are 62 years old; we are 12 years old; we are 40 years old and the game exists in some island outside of time, some eternal present, a corridor into eternity. It is a magic and mystical moment. Is baseball in Toronto dead? Hardly. There are 525,000 viewers tuning in to watch our boys in blue. If less than a 10th of them showed up to the park we would have a full house. Wasn’t this the most fun ever? We should do it. Every day. Why not? Baseball permeates our soul and elevates our heart. 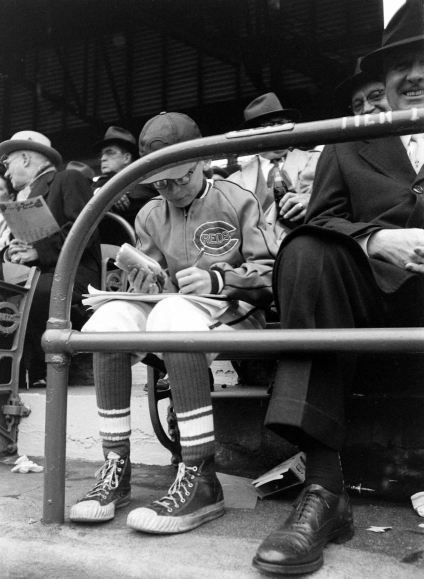 Baseball is a game for dreamers. Its ebbs and flows conducive to using your imagination. Players’ movements exude elegance and artistry. P.S. Hard glove smack to the hind quarters of Go Jays Go, from whom I pilfered a few images. To show your support and be a good fan you do not need to go to every game. You just have to stop making excuses. The following excuses should are not valid. 1) The strike in 1994 runined me as a fan. 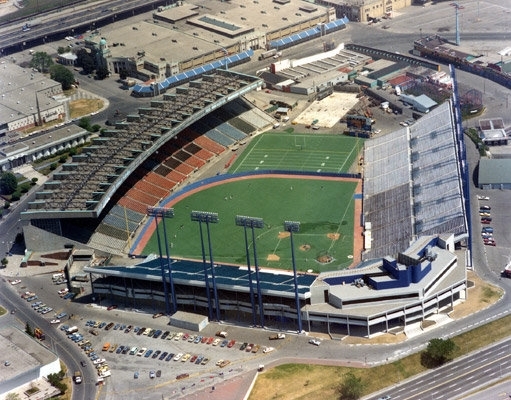 2) The SkyDome (when open) is not a good place to watch a game. 3) Tickets are too expensive for my entertainment dollar. 3) is especially grating. For a ticket in the 500 level for a non-premium game, you only have to shell out $11. That is the best entertainment value in the whole city. 4) For a family of 4 it is going to cost me well over $200. No, it is going to cost you $44 plus your transportation to and from the game. In reality, it is even less than that if tickets are purchased from a scalper for $5 each. Memories are irreplaceable and priceless. Anyone who puts a price on a memory that will last a lifetime is really missing the point of all this. I remember walking through the corridor with my Dad as a kid; it was my first game at the Skydome and it was a packed house and all we could get was the 500 level. The dome was open and the sun was shining and it blinded me as we broke free of the concrete surrounding us and we stepped out into the sunlight. I stood there for a moment rubbing my eyes, letting them adjust to the bright sunshine. As my eyes began to focus I saw before me the place dreams were made of. We were so high up it was dizzying and if it werent for the binoculars around my neck, we never would’ve been able to read the names on the backs of the jerseys. But to me they were the best seats in the house. I remember my dad pointing the players out to me and reminding me that we saw him and him and him on TV. Years later I would be fortunate enough to be sitting beside Mark Eichorn on a bus to the airport and telling him this story with my own Blue Jays Jersey in my bag with my name on it. Not every boy will get to play proball like I did and sit and laugh with some of the best in the game but every dad can share a momoent like that with their kid and it would be worth every dollar! So take advantage of the fact that you can get great seats for a resonable price, get closer to the action than ever before and see one of the greatest games live. Take your kid, take your dad. My son and daughter can hardly wait to go again! Your story of your first game is very similar to my first game. 500 Level, packed house, 4th of July 1992. We sat in the 2nd to top row. As we walked to the correct aisle my dad and brother blocked my view so I could not look out at the field until we walked out and it opened infront of us. I remember being amazed at how high the pop ups would soar. 1) is true. The strike did turn me off the game. I can’t describe how sickened and betrayed I felt when the ’94 series was cancelled. It killed my love of it for many years until my brother dragged me to the ballpark, telling me I owed it to my nephew. Doc took a no-hitter into the 7th and my love started stirring again. But it really took me going to Australia and trying to explain the game to my Aussie friends that brought the love back and me to the ballgame. So people who say that aren’t making excuses. The betrayal ran that deep and I totally understand if they don’t want to go through that again. Please, no disresct but I am calling people out on their integrity tonight. But if you are really betrayed why are you reading this and commenting? It seems that you got over it for the exact reasons Callum has articulated so well. I would be surprised if there are any real ball fans that haven’t been to a game in the last 16 yrs because they feel betrayed. Betrayed if you were an expo’s fan maybe. There was a hockey lockout it didn’t chance anything why would it change baseball. It’s not about you its about the game. Good point Alain. How come Canadian fans weren’t betrayed when the NHL had a lengthy striked? When play resumed fans were out in droves. Not only that…NHL had 2 strikes. One cancelling the Stanley Cup. Terrific post, Callum. There truly is no better place. Once you’re hooked, you’re hooked. Your use of poetry is very moving. I found your post b/c I help run BARDBALL.COM, where we publish baseball poetry every weekday of the season. If these are yours, we would love to publish them. And tell all your Jays pals that we need more poems from Canada! We want to document the whole season, for every team, by the World Series. (And it doesn’t have to be great — we love quick doggerel poems about players, fans, slumps, Ks, whatever moves you to write.) I wrote something this week about the passing of Ernie Harwell that some folks in Southern Ont might enjoy. I live in the UK now and haven’t seen a live game in 4 years. This is a great post, because I would give almost anything for one Saturday afternoon game.